This name uses Spanish naming customs: the first or paternal family name is Piqué and the second or maternal family name is Bernabeu. A product of Barça's cantera, La Masia, Piqué left the club for Manchester United in 2004, where he remained for four years. He returned to Barça under Pep Guardiola's leadership, and helped the club win trebles in 2008–09 and 2014–15. He is one of four players to have won the UEFA Champions League two years in a row with different teams, the others being Marcel Desailly, Paulo Sousa and Samuel Eto'o. Piqué has also represented Spain 102 times, making his debut on 11 February 2009. He played an integral role in the Spain teams that won the 2010 FIFA World Cup and UEFA Euro 2012. Born in Barcelona, Catalonia, Piqué started his career in FC Barcelona's youth teams as a defensive midfielder, but before he signed his first professional contract with the club, he decided to join Manchester United. The Premier League side did not pay a fee for Piqué as he was too young to have a professional contract. Piqué made his debut for Manchester United in October 2004, as a centre back, a 67th minute replacement for John O'Shea in a 3–0 League Cup victory at Crewe Alexandra. He made his full debut in January 2005 in a 0–0 FA Cup draw with Exeter City. Pique made his Premier League debut on 15 October 2005, again as a substitute for O'Shea, in a 3–1 win over Sunderland. His first league start came on 29 March 2006 against West Ham United at Old Trafford, playing at right back, as Gary Neville was unavailable through injury. His performances, most notably in the reserve team, earned him a new contract, which he signed in February 2005, to run until the summer of 2009. On 4 August 2006, however, La Liga side Real Zaragoza secured Piqué on a season-long loan. The conditions of the loan involved Piqué having to feature in at least 20 games for the Aragonese club, which he did, as he made 22 first team appearances in a successful spell, alongside Argentine Gabriel Milito, either as a centre back or a defensive midfielder. On 5 May 2007, it was announced that Piqué would be staying at Old Trafford for the following season. Sir Alex Ferguson had intended to assess Piqué's form at La Romareda on 6 May, prior to a meeting where the two parties would discuss Piqué's future prospects with the club. However, Ferguson was unable to attend on account of airline difficulties. Piqué's return to Old Trafford saw him make nine league appearances during the 2007–08 season. 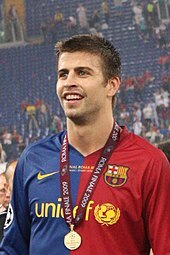 In his first start in the UEFA Champions League, a 4–0 home win against Dynamo Kyiv on 7 November 2007, Piqué scored the first of Manchester United's four goals in that match. In doing so, he became the 450th player to score at least one goal for the club. His second goal for the club also came in the Champions League, in an away match to Roma on 12 December 2007. I am very happy to be back, I didn't think I would be here again but this is very good for me. Manchester United is a great club and I enjoyed winning things. To play with world class players has helped me and now I want to continue this at Barça. Piqué's first goal for Barcelona came in the club's 2–5 Champions League group stage win at Sporting CP on 26 November 2008. His first domestic goal for the club followed two months later, on 29 January 2009, in a Copa del Rey match against local rivals Espanyol. The goal, which came from a corner kick in the 57th minute, turned out to be the game winner in a 3–2 victory for Barcelona. On 2 May 2009, Piqué scored Barcelona's sixth goal in a 2–6 El Clásico win against Real Madrid at the Santiago Bernabéu Stadium, which saw him produce a passionate goal celebration where he grabbed his Barcelona jersey. On 13 May 2009, he picked up the first trophy of his Barcelona career as he helped his club to a 4–1 victory over Athletic Bilbao in the Copa del Rey Final. Three days later, Barcelona clinched the league title after Real Madrid lost 3–2 to Villarreal, with two games left in the season. 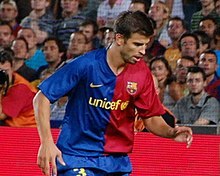 On 27 May 2009, Piqué played against his former club Manchester United in the 2009 Champions League Final, which Barcelona won 2–0, completing a historic treble. On 19 December 2009, Piqué was in the Barcelona team which beat Argentine club Estudiantes 2–1 in the Club World Cup Final. Piqué assisted Pedro's 89th minute equalising goal which took the match to extra-time. On 26 February 2010, Piqué signed a contract extension to keep him at Barcelona until at least summer 2015. On 28 April 2010, Piqué scored in Barcelona's Champions League semi-final second leg against Inter Milan, though his side went out 3–2 on aggregate. On 28 May 2011, Piqué played in his second Champions League Final. Barça defeated Manchester United 3–1 at Wembley Stadium to lift the European Cup for the second time in three seasons. On 1 May 2013, Piqué scored an own goal for Bayern Munich in Camp Nou, making the score 2–0 to Bayern. Later, Bayern went on to win 3–0 and 7–0 on aggregate. On 20 May 2014, Piqué signed a contract extension with Barcelona, keeping him at the club until 2019. On 6 June 2015, Piqué started for Barça in the 2015 UEFA Champions League Final, as the club won its fifth European Cup by beating Juventus at Berlin's Olympiastadion. This made Barcelona the first club in history to win the treble of domestic league, domestic cup and European Cup twice. Piqué, Lionel Messi, Andrés Iniesta, Xavi, Sergio Busquets, Dani Alves and Pedro are the only players to have been a part of both treble-winning teams. On 18 January 2018, Piqué extended his contract again, this time until 2022. Piqué was a member of the Spain under-19 side that won the 2006 UEFA European Under-19 Championship in Poland. In a 2–1 final win against Scotland, Piqué put in a strong performance in defence, hitting the crossbar with a header, and also providing his team's second goal for striker Alberto Bueno. Subsequently, he played in the 2007 FIFA U-20 World Cup, starting all six of Spain's matches and scoring a goal in the team's come-from-behind 4–2 victory over Brazil in the round of 16. However, Piqué missed the deciding penalty in the shoot-out against the Czech Republic and Spain were eliminated at the quarter-final stage. On 6 February 2009, Piqué was called up to the senior squad for the friendly against England on 11 February. He played the entire match in a 2–0 win, in Seville. In his second match as an international on 28 March 2009, he was called up as a replacement for injured teammate Carles Puyol and he scored the only goal in Spain's victory in the 2010 World Cup qualifier against Turkey at the Santiago Bernabéu Stadium in Madrid. Four days later, he also started in Istanbul in a 2–1 win, also in the group stage. Piqué made his tournament debut for Spain at the 2009 FIFA Confederations Cup, starting in four of the team's five matches as La Roja finished in third place. Piqué was Spain's first-choice centre back playing alongside Puyol at the 2010 World Cup finals in South Africa, starting all seven matches as Spain won the tournament, defeating the Netherlands 1–0 in the final. Piqué's partnership with Puyol saw Spain concede only twice in seven World Cup matches and keep four consecutive clean sheets in the knockout stage. In Spain's 1–0 group stage defeat to Switzerland, just before Gelson Fernandes scored the only goal of the game, Swiss striker Eren Derdiyok tumbled over Spain goalkeeper Iker Casillas and accidentally kicked Piqué in the face, knocking him over and leaving him with a nasty cut beside his right eye. Piqué played every minute of Spain's UEFA Euro 2012 campaign, partnering Sergio Ramos in the centre of defence. He successfully converted the team's third penalty in a semi-final shoot-out win over Portugal. In the final, Spain recorded a fifth consecutive clean sheet in a 4–0 win over Italy. Piqué was one of three Spanish defenders included in UEFA's Team of the Tournament as La Roja conceded only one goal in six matches. At the 2013 FIFA Confederations Cup, Piqué was the third of Spain's seven successful takers in a 7–6 shootout win over Italy at the semi-final stage. On 30 June 2013, Piqué was sent off during the final against Brazil. He received a straight red card in the 68th minute for a violent tackle on recently signed Barcelona teammate Neymar. The match finished 3–0 to Brazil, ending Spain's world record 29 match unbeaten run in competitive internationals. In Spain's opening group game of UEFA Euro 2016 on 13 June, Piqué scored his fifth goal for his country, a late header in a 1–0 victory against the Czech Republic. In Spain's second group match of the 2018 FIFA World Cup on 20 June, a 1–0 win against Iran, Piqué made his 100th international appearance. On 11 August 2018, Piqué announced his retirement from international football. Piqué is a modern defender, who combines strength with good technique and passing. Due to his height and physical attributes, he is good in the air. Although he is primarily deployed as a centre back, he is a tactically versatile player who is capable of playing as a defensive midfielder; he has also been deployed as a sweeper on occasion, showing similarities to German legend, Franz Beckenbauer, thus earning the sobriquet "Piquénbauer". He has also occasionally been known to use his height as an additional attacking threat by advancing into more offensive positions. Piqué was raised in a Catalan family. His father, Joan, is a businessman, and his mother, Montserrat, is the director of a spinal injuries hospital in Barcelona. He has a younger brother, Marc. His grandfather, Amador Bernabeu, is a former vice-president of Barcelona. During the controversial 2017 independence referendum in Catalonia, he was seen by many as one of the public faces of the Catalan side of the argument, voting and tweeting his support in Catalan. He subsequently faced backlash from some Spanish fans for his support of the Catalan independence referendum. Since early 2011, Piqué has been in a relationship with Colombian singer Shakira. They met when he appeared in the music video for her single "Waka Waka (This Time for Africa)", the official song of the 2010 FIFA World Cup. Piqué and Shakira share the same birthday, but she is ten years his senior. The couple have two children, Milan and Sasha. Piqué was the face of Mango's men's line HE for four consecutive campaign seasons between 2011 and 2012. In 2012, he lent his voice to the Catalan version of The Pirates! In an Adventure with Scientists! as the Pirate King. Piqué is the founder and president of Kosmos Holding, a sports and media investment group he started with Hiroshi Mikitani (founder and chairman of Japanese e-commerce firm Rakuten, Inc.), Edmund Chu, Nullah Sarker, and Mike Evans. Kosmos has struck a partnership with the International Tennis Federation for a 25-year, $3 billion partnership that will transform the Davis Cup and generate substantial revenues for global tennis development. In August 2018, U.S. billionaire Larry Ellison published a public letter stating that he is joining the Kosmos group. Piqué playing in the Iberian derby against Portugal in the 2018 FIFA World Cup. As of match played 6 October 2017. Spain score listed first, score column indicates score after each Piqué goal. ^ "Gerard Piqué". L'Équipe. Paris. Retrieved 10 March 2019. ^ "FIFA World Cup South Africa 2010: List of Players: Spain" (PDF). FIFA. 4 June 2010. p. 29. Retrieved 10 March 2019. ^ a b c d "Gerard Piqué profile". FC Barcelona. Retrieved 24 March 2015. ^ Bogunyà, Roger (28 May 2009). "Three titles and personal records". FC Barcelona. Archived from the original on 31 July 2012. Retrieved 25 June 2010. ^ "Crewe 0–3 Man Utd". BBC Sport. 26 October 2004. Retrieved 27 May 2008. ^ "Man Utd 1–0 West Ham". BBC Sport. 29 March 2006. Retrieved 16 January 2015. ^ "Zaragoza's Piqué: My future is with Man Utd". OnTheMinute.com. Retrieved 30 January 2007. ^ Hibbs, Ben (4 May 2007). "Piqué set for OT return". Manchester United F.C. Retrieved 16 January 2015. ^ McNulty, Phil (7 November 2007). "Man Utd 4–0 Dynamo Kiev". BBC Sport. Retrieved 3 May 2010. ^ "All Goalscorers in all Competitive Matches". The Website of Dreams. StretfordEnd.co.uk. November 2007. p. 5. Retrieved 8 November 2007. ^ Herbert, Ian (13 December 2007). "Roma 1 Manchester United 1: Piqué's joy on pitch marred by violence off it". The Independent. Retrieved 25 June 2010. ^ "Piqué comes back home". FC Barcelona. Archived from the original on 27 June 2010. Retrieved 25 June 2010. ^ Lowe, Sid (25 May 2009). "Gerard Piqué is back at Camp Nou, the man with Barcelona in his DNA". The Guardian. Retrieved 30 November 2010. ^ "Sporting Lisbon 2 – 5 Barcelona". ESPN FC. 26 November 2008. Retrieved 12 March 2013. ^ "Jose Mourinho's Inter Milan progress despite defeat to Panathinaikos". The Daily Telegraph. 26 November 2008. Retrieved 12 March 2013. ^ "Barcelona 3 – 2 Espanyol". ESPN FC. 29 January 2009. Retrieved 2 July 2009. ^ "Barcelona into Copa del Rey semis". The Daily Telegraph. 29 January 2009. Retrieved 12 March 2013. ^ "Real Madrid-Barcelona: Celebrations in enemy territory". Marca. 24 April 2017. Retrieved 16 October 2018. ^ "REAL MADRID – FC BARCELONA 2–6". FC Barcelona. 2 May 2009. Archived from the original on 28 February 2014. Retrieved 10 August 2013. ^ "Barcelona defeat Athletic Bilbao to win Copa del Rey". The Daily Telegraph. 14 May 2009. Retrieved 12 March 2013. ^ "Real Madrid loss hands La Liga title to Barcelona". The Daily Telegraph. 16 May 2009. Retrieved 12 March 2013. ^ "Barcelona 2–0 Man Utd". BBC Sport. 27 May 2009. Retrieved 12 March 2013. ^ "Guardiola salutes his treble winners". UEFA. 28 May 2009. Retrieved 12 March 2013. ^ "Barcelona add world title to trophy haul". CNN. 19 December 2009. Retrieved 10 August 2013. ^ "Piqué signs new Barcelona deal". MirrorFootball. Mirror Group Newspapers. 26 February 2010. Retrieved 12 March 2013. ^ "Piqué extends Barcelona contract". UEFA. 26 February 2010. Retrieved 12 March 2013. ^ "Gerard Piqué signs on till 2019". FC Barcelona. 20 May 2014. Retrieved 22 May 2014. ^ Haslam, Andrew (6 June 2015). "Barcelona see off Juventus to claim fifth title". UEFA. Retrieved 7 June 2015. ^ "Gerard Piqué and FC Barcelona renew contract through to 2022". FC Barcelona. 18 January 2018. Retrieved 18 January 2018. ^ "Spain-Brazil Match Report". FIFA. Archived from the original on 14 February 2008. Retrieved 2 April 2008. ^ "Spain – Czech Republic Match Report". FIFA. 14 July 2007. Retrieved 22 June 2013. ^ "Lista de convocados para el amistoso ante Inglaterra" (in Spanish). Real Federación Española de Fútbol. 6 February 2009. Retrieved 6 February 2009. ^ Iliev, Nick (12 February 2009). "International Friendly: Spain completely outclass England". The Sofia Echo. Retrieved 25 June 2010. ^ "Del Bosque Analyses Spain's Turkey Win". Goal.com. 29 March 2009. Retrieved 25 June 2010. ^ "Turkey 1–2 Spain: Riera earns comeback victory". ESPN FC. 1 April 2009. Retrieved 25 June 2010. ^ McCarra, Kevin (11 July 2010). "World Cup 2010 final: Andrés Iniesta finds key for Spain to beat Holland". The Guardian. Retrieved 12 March 2013. ^ Sheringham, Sam (16 June 2010). "Spain 0–1 Switzerland". BBC Sport. Retrieved 16 January 2015. ^ "Brazil Caps Confederations Cup Marked by Protests With Title". Bloomberg. 1 July 2013. Retrieved 10 August 2013. ^ Saffer, Paul (13 June 2016). "Piqué pounces for late Spain win". UEFA. Retrieved 14 June 2016. ^ "Diego Costa Guides Spain Past Impressive Iran". www.beinsports.com. 20 June 2018. Retrieved 23 June 2018. ^ "Gerard Pique plays for Catalonia in friendly against Venezuela". 25 March 2019 – via www.bbc.com. ^ Simpson, Christopher (6 July 2016). "Gerard Pique Has 'Piquenbauer' Beer Named After Him in Barcelona Tribute". Bleacher Report. Retrieved 30 April 2017. ^ "Gerard Piqué Bernabeu". Retrieved 2 February 2015. ^ "Hierro: 'Piquenbauer' has striker's soul". FourFourTwo. 3 May 2010. Retrieved 7 January 2016. ^ "Familia sólo hay una". El Periódico de Aragón (in Spanish). 5 August 2006. Archived from the original on 10 July 2011. Retrieved 15 March 2011. ^ "Gerard Piqué – World Cup 2010". Soccernet. ESPN. Retrieved 15 March 2011. ^ Lowe, Sid (25 May 2009). "Gerard Piqué is back at Camp Nou, the man with Barcelona in his DNA". The Guardian. Retrieved 31 May 2009. ^ West, Andy (1 October 2017). "Catalan referendum: How FC Barcelona found themselves at centre of issue". BBC Sport. Retrieved 2 October 2017. ^ "Spain fans boo Barcelona's Pique at football training". BBC News. 3 October 2017. Retrieved 3 October 2017. ^ "Piqué confirms Shakira relationship on request from Barcelona coach Guardiola". tribalfootball.com. Retrieved 7 February 2011. ^ "Antonio de la Rúa, Shakira's Ex-Boyfriend, Sues Star For $250 Million". The Huffington Post. 6 September 2012. Retrieved 24 January 2013. ^ "First picture: Shakira and Gerard Piqué's two-week-old baby Milan". Daily Mirror. 4 February 2013. Retrieved 12 March 2013. ^ "Shakira baby: The name of the little boy revealed". Hellomagazine.com. 30 January 2015. ^ "Gerard Piqué for H.E. by Mango Spring 2011 Campaign". The Fashionisto. 24 February 2011. Retrieved 29 March 2011. ^ Wray, Michelle (15 March 2011). "Gerard Pique Launches He by Mango Spring/Summer 2011 Collection Pictures". Monsters and Critics. Archived from the original on 24 March 2011. Retrieved 29 March 2011. ^ "Gerard Pique, Mango image for the fourth time". La Vanguardia. 23 July 2012. Retrieved 2 August 2012. ^ "TV3 TN migdia 6_8_2012 Piqué doblatge Pirates". YouTube. Retrieved 10 August 2014. ^ "Owner of Rakuten supports Gerard Pique in Players Tribune expansion". Palco 23 (in Spanish). 17 April 2018. Retrieved 8 August 2018. ^ "ITF announces plans for transformation of Davis Cup". ITF Tennis. 26 February 2018. Retrieved 8 August 2018. ^ "American billionaire Larry Ellison backs Indian Wells to host revamped Davis Cup". Reuters. 7 August 2018. Retrieved 8 August 2018. ^ "Spain – G. Pique". Soccerway. Retrieved 14 March 2018. ^ "Games played by Gerard Piqué in 2004/2005". Soccerbase. Centurycomm. Retrieved 14 March 2018. ^ "Games played by Gerard Piqué in 2005/2006". Soccerbase. Centurycomm. Retrieved 14 March 2018. ^ a b "Games played by Gerard Piqué in 2006/2007". Soccerbase. Centurycomm. Retrieved 14 March 2018. ^ "Games played by Gerard Piqué in 2007/2008". Soccerbase. Centurycomm. Retrieved 14 March 2018. ^ "Games played by Gerard Piqué in 2008/2009". Soccerbase. Centurycomm. Retrieved 14 March 2018. ^ "Games played by Gerard Piqué in 2009/2010". Soccerbase. Centurycomm. Retrieved 14 March 2018. ^ "Games played by Gerard Piqué in 2010/2011". Soccerbase. Centurycomm. Retrieved 14 March 2018. ^ "Games played by Gerard Piqué in 2011/2012". Soccerbase. Centurycomm. Retrieved 14 March 2018. ^ "Games played by Gerard Piqué in 2012/2013". Soccerbase. Centurycomm. Retrieved 14 March 2018. ^ "Games played by Gerard Piqué in 2013/2014". Soccerbase. Centurycomm. Retrieved 14 March 2018. ^ "Games played by Gerard Piqué in 2014/2015". Soccerbase. Centurycomm. Retrieved 14 March 2018. ^ "Games played by Gerard Piqué in 2015/2016". Soccerbase. Centurycomm. Retrieved 14 March 2018. ^ "Games played by Gerard Piqué in 2016/2017". Soccerbase. Centurycomm. Retrieved 14 March 2018. ^ a b "Games played by Gerard Piqué in 2017/2018". Soccerbase. Centurycomm. Retrieved 14 March 2018. ^ a b "Piqué, Gerard". National Football Teams. Benjamin Strack-Zimmerman. Retrieved 4 March 2016. ^ "Gerard Piqué – national football team player". EU-Football.info. 11 October 2015. Retrieved 11 October 2015. ^ "Gerard Piqué: Overview". Premier League. Retrieved 17 April 2018. ^ Cheese, Caroline (5 August 2007). "Chelsea 1–1 Man Utd". BBC Sport. Retrieved 17 April 2018. ^ "How brilliant is Barcelona defender Gerard Piqué?". UEFA. 3 October 2018. Retrieved 15 March 2019. ^ "ESM Team of the season". World Soccer. Retrieved 5 June 2012. ^ "Die ESM-Topelf der Saison 2013/14 – ein Deutscher ist dabei" (in German). kicker.de. Retrieved 15 June 2014. ^ "Die ESM-Topelf der Saison 2014/15 – ein Deutscher ist dabei" (in German). kicker.de. Retrieved 11 June 2015. ^ "Las campeones del mundo de fútbol ya tienen la Real Orden del Mérito Deportivo". Mundo Deportivo (in Spanish). 5 October 2011. Wikimedia Commons has media related to Gerard Piqué.